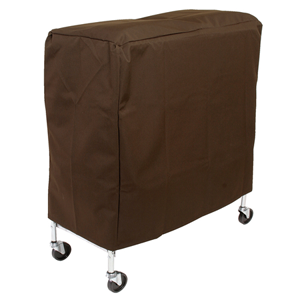 This Folding Bed Storage Cover is made for hotels, so it has the toughness needed for nearly any home environment be it hallway closet, attic, basement, bunker, converted Minuteman missile silo, shed, or lean-to. Please note the dimensions of this cover when determining fit. There is a size for any one of our Rollaway Beds. See Below. This is an excellent cover, nonetheless, for keeping dust, falling debris, and dirt from falling on your folding bed. Rollaway Bed Cover - Heavy-Duty 600 Denier Washable Polyester With Polyurethane Coating - Stain And Mildew Resistant - Water Repellent - In.D - Brown - Fits Most Roll-away Bed Up to Twin Size.